Jahan's grief for the loss of Mumtaz, who died during the birth of their 14th child, and illustrates their love story, traditionally known as the inspiration for the Taj Mahal. 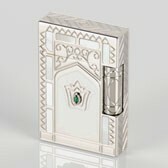 S.T.Dupont draws inspiration from this legendary monument to create a collection of exceptional objects using the most noble and precious materials, platinum and mother-of-pearl, joined together by S.T. Dupont's skilful craftsmen. S.T. Dupont Taj Mahal Limited Edition is made up of two pocket lighters, numbered out of 2000, a fountain pen and ballpoint numbered out of 1000, a table lighter numbered out of 200.